I was sitting in a coffee shop with a friend–a pastor–talking through Mark. We were deeply engaged in what Mark wrote, seeking to get in on what the Spirit inspired him to record for our benefit. As we drew our conversation to a close, a gentleman at a neighboring table asked if he could say something. He apologized if he was interrupting; he didn’t want us to feel he had been eavesdropping. He said that he couldn’t help hearing what we were talking about and just wanted to add a thought or two. He made an observation about what we had been discussing, saying it was something that he “always thought” because of what “he had read in Luke.” We weren’t entirely convinced of the rightness of his conclusion, but it wasn’t a problem that he wanted to offer his opinion. We thanked him for sharing. When my friend left, I took the next step and introduced myself to this table neighbor. And the conversation turned to “what do you do?” kinds of things. And then he asked me what denomination I belonged to. I thought that was an interesting question, so I asked him what he meant by that. And it became a bit clearer. He continued to argue–in a gentle but determined way–that there is only one person in God. That the Father clothed Himself with humanity and became the Son. That the Son, after the resurrection, became the Spirit who fills believers. He kept asking questions like: “Why would God have to be three persons? Why would the Father have to have a Son to send?” My response was to insist that is not a question of what “had” to be but what the Scriptures actually teach. And he proceeded to misquote passages. When I sought to clarify what it was the passages he quoted actually said, he back-pedaled and explained that what he was talking about was “biblical” (even if he got the verse a bit wrong) and would again resort to “but doesn’t it make sense that . . .” kind of arguments. Hopefully I was as gracious as I thought I was. I wanted to invite him to be more honest with what the Bible actually says. I told him I was sad for him because I thought he misunderstood what God was like because He wasn’t being honest with what Scripture actually says. But then the exchange took another fascinating turn. A woman sitting near us had been listening to the exchange. She asked if she could say something. And we invited her input. She asked: “Do you both believe in God? Do you both believe in Jesus? Do you both believe in the Spirit? 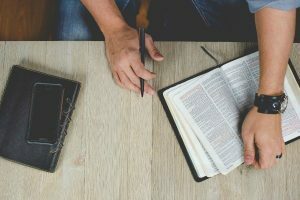 Then why are you sitting here arguing about this?” I spoke up and referenced Paul’s words to the Corinthians about those who bring “another Jesus;” I wanted to clarify that thinking well about what God is like is absolutely crucial. And she responded. And there I sat . . . stunned. As sincere as the man was, he was mishandling Scripture and was arguing for a view of God that is heretical; he doesn’t know the God who saves. As well-intentioned as the woman was, she was dismissing Scripture and was insisting that the only thing that really matters is that you say you “believe in Jesus” (regardless of what that means) and embrace what God “says to you” (apart from what the Scriptures actually may say); she wasn’t worried about whether the God one believes in is the God of the Bible. There is only one sure way to know we know the God of the Bible. We have to read the text! To not be honest about what the Scriptures say (as the man did) or to dismiss the Scriptures as not “literal” and not necessary to know God (as the woman did) leaves us with a God of our own creation. And there is no reason to believe that that God can actually save!